Welcome to EverQuest Next: Landmark, a groundbreaking new title from Sony Online Entertainment and engine of the long awaited EverQuest Next MMORPG. 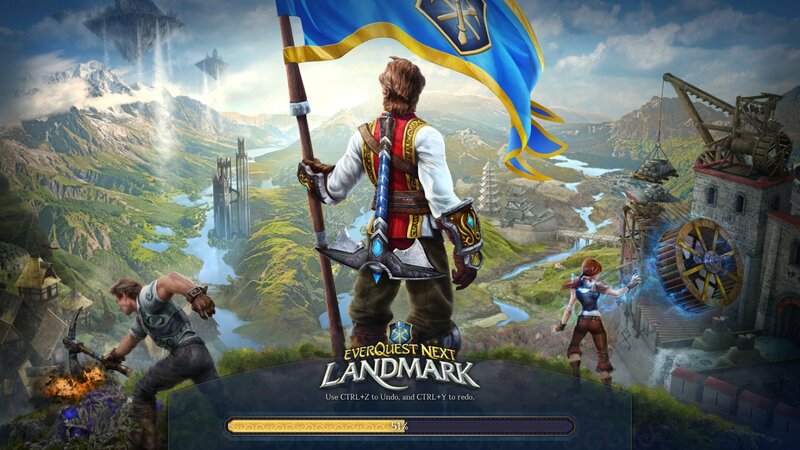 At its heart, Landmark is a gathering/building game in the same vein as MineCraft, but has many MMO-like qualities that are expected to be added as the game evolves. The purpose of this guide is to help new and aspiring players quickly attain the knowledge and in-game resources and tools required to begin building advanced structures in EverQuest Next: Landmark. If you are an EverQuest Next: Landmark “Founder”, you will find in your inventory (hotkey “I”) your exclusive items, including clothes, accessories, and a Founder’s Pickaxe. Equip any desired items on your character (hotkey “H”) and you’re all set! Another important hotkey to know is to your map (hotkey “M”). Alternatively, or if you forget the hotkeys, most of these menus can be found in the lower left portion of the screen with an appropriate icon. This is also a good time to place items in your toolbar to easily swap between tools. Simply drag and drop the item from your inventory into the desired toolbar hotkey (labeled numbers 1 through 0). Oh, and if the default view is too close for you, use “Shift+Mouse Wheel” to zoom in and out from your character. Movement is controlled by the common WASD keys with no custom key binding yet supported. Jump using the space bar; run by holding down shift. You will begin at a Ley Line. Ley Lines are large pyramid-shaped structures that serve as rapid travel to and from other continents/islands. To use the Ley Line, approach the floating gem in the center and left-click to reveal a menu of Servers and Continents. At each Ley Line, there will also be a Stone Forge. The Stone Forge is the most basic crafting station that will serve you as you advance to Tier 2 tools and resources. Now let us begin! NOTE: If you wish to immediately claim land and begin to build a structure, you’re able to do so; albeit with limited capabilities. In order to use more advanced building tools (such as the Selector, Paint, and Smooth tools) and higher quality materials (such as iron, marble, etc.) you must first obtain the tools and resources to do so. Thus the purpose for this guide. Well then, let’s get to it! Resources can currently be divided into 4 unique types: Metals, Gems, Stones, and Woods. All of which are required, in various combinations and quantities, to craft more powerful harvesting tools (such as the pick and axe), as well as improved crafting stations and player accessories. Each resource fits into a “tier”, or general rating of the difficulty and experience required to gather it. In order to advance to harvesting higher rated metals and gems, you must craft or upgrade tools in order to gather the next “tier”. There are currently Tier 1-4 resources in alpha. You should have begun your journey on a Tier 1 continent/island, and will eventually be forced to travel to a higher Tier 2 or Tier 3 continent/island in order to continue advancing your gathering and crafting skills. Upon finding a mineral vein, equip your pick (in this case the Founder’s Pickaxe), move the circular reticule over the miner until it turns blue, then left-click to begin mining. Hold down your mouse button to mine continually while directing the target location and view with your movement keys and right mouse button. It may also help to zoom in on your character. NOTE: When mining, be sure to leave an easy path back out or you’ll be forced to mine your way back out. It is also important to note that mineral veins (and the rest of the world, save “claimed” land) “heals” itself over time. So if you choose to burrow deep within the ground, know that it will begin to fill in after about 20-30 minutes. TIP: Equip the Ring of Bounty for a +10 Harvest Bonus, increasing the amount of ore you get each hit. Once you’re able to craft the “Keen-Eye Band” from a Marble Forge, a pair of these improves Detection by 2, increasing the chance to harvest rare Elemental minerals. If you’re in a forested area or happen across a tree in the deserts, equip your Founder’s Pickaxe and approach a tree. You can currently harvest only small and medium-sized trees. The largest trees are not yet harvest-able in Alpha. Your selected tree should glow orange, indicating that it can be harvested. Left-click the tree and watch for a green progress bar at the top of your screen to know that you’re hitting it. TIP: Equip the Ring of Bounty for a +10 Harvest Bonus, increasing the amount of wood you get each hit. Now that you’ve got the gist of gathering resources, what do you do with them? And in what order? Below you’ll see an ordered list of what you should craft in order to advance your harvesting and crafting skills the quickest. I hope you enjoyed this brief guide to start you on your journey in Landmark. There’s sure to be more to come as we’re just in alpha, so bookmark this page and check back often! Updates, comments and suggestions welcome in the comments section below. Good luck and have fun in Landmark!